Basketball is a sport played by two teams of five players on a rectangular court. 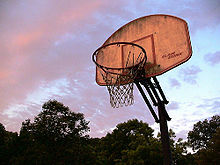 The objective is to shoot a ball through a hoop 18 inches (46 cm) in diameter and 10 feet (3.048 m) high mounted to a backboard at each end. The game of basketball is one of the greatest teachers of life there is. It teaches you first and foremost to believe in yourself. You must develop physical and mental toughness in order to succeed because there's going to be many disappointments and setbacks along the way. You learn quickly that basketball is a team game. You must be unselfish and accept the role that helps the team the most. Basketball teaches you the importance of setting high standards and never accepting anything other than your best effort. I've missed over 9,000 shots in my career. I've lost almost 300 games. 26 times I've been trusted to take the game-winning shot and missed. I've failed over and over and over again in my life. And that is why I succeed. I don’t miss basketball. I live very well, thank God. I have my interests, interests in agriculture. This page was last edited on 26 January 2019, at 03:05.